Although most palms are grown outdoors, many people use indoor palm trees for beautifying their homes and offices. Besides giving an interior a tropical and stylish feeling, indoor palm trees supply an environment with moisture and good oxygenation for improving air quality. Several species of attractive palms, such as arecas, kentias, lady palms and others, are suited for low-lighting conditions found indoors, making them excellent choices as houseplants. Most indoor palm trees grow exceptionally erect, notes PlantCare.com. The height of a palm tree depends on where it’s placed. While shopping malls and hotels can accommodate significantly taller, upright-growing palms, trees intended for homes should be smaller, such as kentia or rhapis palms. Even smaller palms, such as Neanthe bellas, are more suited as tabletop plants. Lady palms are common indoor trees with fan-shaped leaves. Known for their indoor longevity and easy care, they grow slowly, only producing one to two new leaves each year. Arecas are multi-trunked and have stems with arching green or yellow-green fronds. They produce yellowish-white flowers and tiny yellow-orange fruit. Pygmy dates have dark green fronds that are more delicate than other types of palm leaves. Christmas palms, also called royal dwarf palms or Manila palms, resemble the royal palm tree. Mediterranean fan palms have compact clumps that grow slowly, but eventually reach heights of about 15 feet, notes Botanical Journeys Plant Guide. Sago palms are good indoor trees, but they really aren't palm trees as most people consider them to be one. Because the sago has a rough brown trunk, along with dark green fronds, it has deceived many plant caretakers who believe it’s a palm tree, cautions Botanical Journeys Plant Guide. This tree actually is a cycad, which belongs to the Cycadaceae plant order, made up of plants with fern-like foliage and unbranched stems. Because palms prefer warm, humid conditions, growing them indoors generally isn’t a concern. On the hand, insufficient humidity and excessive dry heat can hurt palm leafs, according to Florida Palm Trees. Palm trees should be placed away from any heaters or air conditioners to avoid problems. 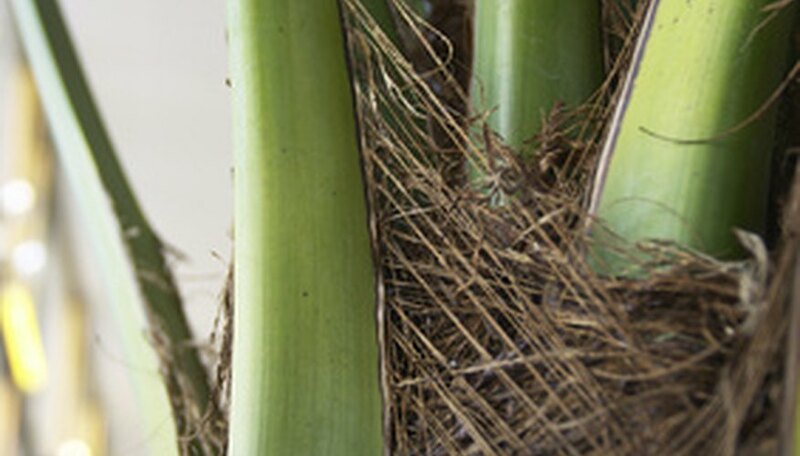 In warmer months, indoor palms can benefit by spending some time outdoors, but gradually adapt them to bright sun. Although many palm trees are sold as houseplants, some marketed for indoor use don’t do well inside. They can be high-maintenance or not live long when grown in a container indoors. According to the Learn2Grow website, an ideal houseplant should not grow too quickly or too tall. They shouldn’t be harmful to children and pets, such as the fishtail palm, which is listed as a toxic plant on the University of Connecticut website. The fishtail palm gets its name from its light green leaflets that are shaped like a tail fin. How Long Do Palm Trees Live?